Advance your understanding of correct saddle fit and how it will improve your riding. We add more schedule dates as they are set. However, we don't usually post our semi private fittings. So please check with us to see if we might be near you soon. We will be visiting multiple locations. Please call if you are interested in being added to the schedule or if you just want to audit a fitting to understand fit better. Call to get on our schedule! We often present Free Sadle Fit Demonstrations/Discussions for various riding organizations in CA, WA, OR & NV. We very frequently do semi-private fit demonstrations which we do not post. Please let us know if you are interested when we may be in your area. Please let us know in advance if you are interested in any of our services while we are in your area! 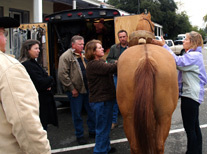 UC Davis Horse Day - Improve your understanding of fit and how it affects your riding. This was an interactive presentation for all interested riders and horse lovers. It was part of a full day of educational horse topics including leg dissection, farriery, nutrition, conformation, training & reproduction. Horse Day was a Grand Success! Saddle Fit for Mounted Officers Understanding fit and how it affects the Job. This interactive presentation for Mounted Police Officers paid special attention to what happens when you ride or stand for long periods, and how to make the job easier for both officer and horse. Officers advanced their knowledge & skills with hands-on examples and lots of Q & A time. We can come to your horse(s) and barn at your convenience and work with you individually to address your specific situation. Click here for details. Additional horses with the same rider receive a discount fitting price. Sponsor a Saddle Fit Clinic at your barnand you can participate for free - or earn a profit! We provide clinic advertising flyers & promotional materials. You invite your riding buddies, clients and friends. Everyone has a great day and You get the Kudos! 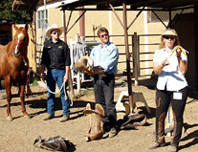 We can also arrange a Saddle Fit Clinic day at your ranch or barn that you sponsor, but we coordinate. The cost is reduced for each participant, and you don't have to worry about a financial obligation. If you would like to be notified of an upcoming clinic in your area, click here and tell us your name, area and phone number (not manditory). When we get enough interested riders in one area we will we schedule a clinic at a local barn, and let you know about it!